I’m excited to announce a recent paper to come out of the lab, by former PhD student Dorothy Maguire, and with Dr. Elena Bennett. In this work, we studied the amount of insect herbivory in forest patches in southern Quebec: the patches themselves varied by degree of fragmentation (ie, small versus large patches) and by connectivity (ie, isolated patches, or connected to other forest patches). We studied herbivory on sugar maple trees, both in the understory and canopy, and at the edges of the patches. Our research is framed in the context of “ecosystem services” given that leaf damage by insects is a key ecological process in deciduous forests, and can affect the broader services that forest patches provide, from supporting biodiversity through to aesthetic value. Dorothy’s research was part of a larger project about ecosystem services and management in the Montérégie region of Quebec. The work was tremendously demanding, as Dorothy had to select sites, and within each site sample herbivory at multiple locations, including the forest canopy (done with the “single rope technique). Dorothy returned to sites many times over the entire summer to be able to assess trends over time. Herbivory itself was estimated as damage to leaves, so after the field season was completed, thousands of leaves were assessed for damage. The entire process was repeated over two years. Yup: doing a PhD requires a suite of skills in the field and lab, and there is no shortage of mind-numbing work… Dedication is key! As with most research, we had high hopes that the results would be clear, convincing, and support our initial predictions – we certainly expected that forest fragmentation and isolation in our study landscape would have a strong effect on herbivory – after all, our study forests varied dramatically in size and isolation, and herbivory is a common and important ecological process, and insect herbivores are known (from the literature) to be affected by fragmentation. The landscape of southern Quebec. Lots of agriculture, some patches of forest. However, as with so much of ecological research, the results were not straightforward! “It’s complicated” become part of the message: patterns in herbivory were not consistent across years, and there were interactions between some of the landscape features and location within each patch. For example, canopies showed lower levels of herbivory compared to the understory, but only in isolated patches, and only in one of the study years! We also found that edges had less herbivory in connected patches, but only in the first year of the study. Herbivory also increased as the season progressed, which certainly makes biological sense. So yes, it’s complicated. At first glance, the results may appear somewhat underwhelming, and the lack of a strong signal could be viewed as disappointing. However, we see it differently: we see it as more evidence that “context matters” a great deal in ecology. It’s important not to generalize about insect herbivory based on sampling a single season, or in only one part of a forest fragment. The story of insect herbivory in forest fragments can only be told if researchers look up to the canopy and out to the edges; the story is incomplete when viewed over a narrow time window. In the broader context of forest management and ecosystem services, we certainly have evidence to support the notion that herbivory is affected by the configuration of the landscape. But, when thinking about spatial scale and ecosystem processes, careful attention to patterns these processes “within” forest patches is certainly required. We hope this work will inspire others to think a little differently about insect herbivory in forest fragments. Dorothy’s hard work certainly paid off, and although the story is complicated, it’s also immensely informative and interesting, and sheds light on how big landscapes relate to small insects eating sugar maple leaves. 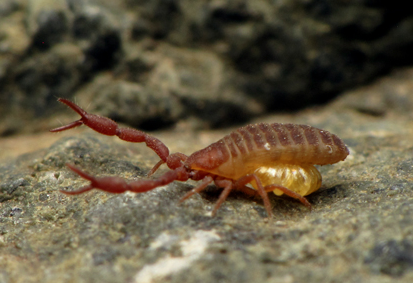 The Beringian Arctic pseudoscorpion is a charming Arachnid, living under rocks near sub-arctic rivers and streams, in primarily unglaciated parts of the Yukon. It has captured my fascinating for years, and the story of its natural history is starting to unfold. 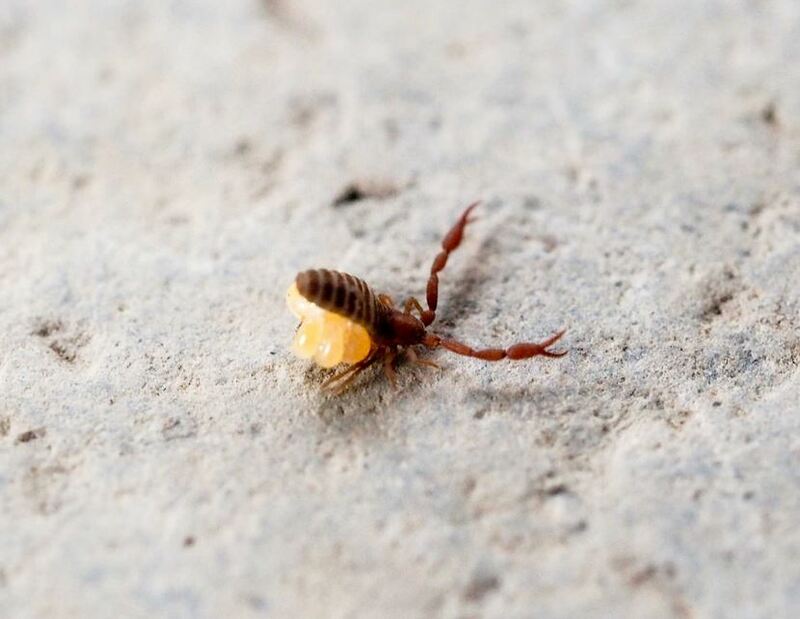 However, some fundamentals about the biology of Wyochernes asiaticus remain unknown: as the most northern pseudoscorpion in North America, how does it survive in such cold climates? How is it adapted to frequent flooding that occurs in its primary habitat, next to streams and rivers? Science is a collaborative process, and I teamed up with two thermal biologists to start to answer some of these physiological questions. PhD student Susan Anthony and Prof. Brent Sinclair*, both from Western University in Ontario, came to the Yukon with us last summer, and together we collected pseudoscorpions at Sheep Creek, just north of the Arctic Circle. Part of Susan’s PhD research is about the thermal biology of Arachnids, so Susan and Brent wanted to see what we could learn about Arctic pseudoscorpions. They brought the wee arachnids back to Ontario, and Susan ran a series of experiments, resulting in a recent publication (in Polar Biology). Susan Anthony and Brent Sinclair, both from Western University. The experiments may sound a little cruel, but they are the standard approach when studying some of the cold tolerance, thermal biology and physiology of arthropods. Susan heated up and cooled down the critters, and discovered that they can survive up to about 38 degrees Celsius, and down to about -7 degrees Celsius. The upper threshold is relatively low compared to other arthropods, which makes sense since W. asiaticus lives at high latitudes. Because the specimens didn’t survive freezing, we know it’s ‘freeze avoidant’ rather than ‘freeze tolerant’. This is aligns with what we know from many other northern (or southern! i.e, in the Antarctic) arthropods. Presumably the pseudoscorpions adapt to the north by being able to supercool, or perhaps by cryoprotective dehydration,. However, its lower threshold isn’t that low, given the extreme cold winter temperatures in the Yukon. But since our collections were in the mid-summer, this might mean it’s not yet started to adapt, physiologically, for the colder winter conditions. The next experiments involved immersing the pseudoscorpions in water and seeing how long they survive. This was done because we were very curious to know how these tiny animals might live in habitats that flood frequently. Amazingly, 50 percent of the arachnids survived under water for up to 17 days (! ), and after testing with de-oxygenated water, Susan had a similar result: they certainly weren’t relying on oxygen in the water for breathing. Susan did notice, however, that they appeared to have a silvery bubble or ‘film’ around their bodies when immersed so we assume they used this air bubble for breathing during the immersion period, something known from other arachnids. Sheep Creek, Yukon – a habitat that frequently floods: now we know how the tiny Arachnids survive the flooding! Putting this in the context of the pseudoscorpion’s habitat in the Yukon: it seems that the sub-arctic rivers in the Yukon typically flood for periods up to 10 days, in the spring. Our little arachnid likely just hunkers down in their habitats under rocks, breathing from air trapped around its body, waiting for floodwaters to recede. I’m very excited about this paper, in part because of what we have learned that links the ecology of the species to its physiology. I’m also excited because this work represents a major advancement in the fundamental knowledge about Arachnids. Our work is the first to uncover any basic biology related to the physiological adaptations of pseudoscorpions to cold/heat and to immersion tolerance. This is kind of stunning: the Pseudoscorpiones are an entire Order of Arachnids, yet nobody has ever worked to figure out how they adapt, physiologically, to extreme environmental conditions. AN ENTIRE ORDER! And it’s 2015! 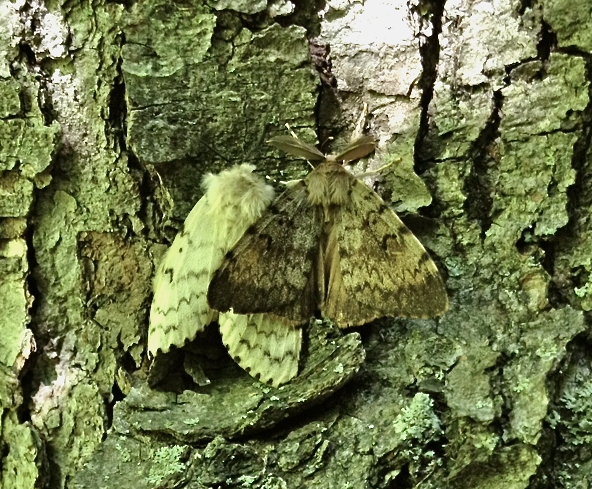 An analogy would be figuring out that some butterflies (Order Lepidoptera) bask in the sun, to thermoregulate. Or, like figuring out how ducks (Order: Anseriformes) don’t freeze their feet when standing on ice. These are ‘textbook’ examples of thermal biology and physiology – such facts could be considered common knowledge. Yet looking to the Arachnids, the story of the thermal biology of pseudoscorpions has only just begun. One paper at a time, we will continue to make progress. The Arctic pseudoscorpion: it has stories to tell. Photo by C. Ernst, reproduced here with permission. As Tschinkel & Wilson state, every species has an epic tale to tell. Even tiny arachnids that live under rocks above the Arctic circle are proving interesting for many scientific disciplines: each chapter of its story is starting to unfold, and I’m quite sure there are a lot of very interesting chapters still to come. Anthony, S.E., C.M. Buddle and B.J. Sinclair. 2015. Thermal biology and immersion tolerance of the Beringian pseudoscorpion Wyochernes asiaticus. Polar Biology. *A sincere thanks to Brent and Susan for including me on this paper, and for being willing to come to the Yukon with our team, to do collaborative research. I’ve learned a great deal in the process, and am delighted that partnerships between ecologists and physiologists can work out so well. I’m pleased to announce a publication about the natural history of a tiny, wonderful arachnid: the pseudoscorpion Wyochernes asiaticus. I’ve published quite a few papers, but this one is really special: it’s special because it’s about an obscure creature for which virtually *nothing* was known. It’s about a species with a fascinating distribution. To me, it’s an epic tale about a species that nobody really cares that much about. It’s special because it is research that was done just out of pure curiosity and fascination: there was no larger purpose, no great problem to solve, and no experiments to run*. It was based on observation and observation alone, and it was a long slog – done over many, many years (it took about 7-8 years to pull together this story, and this story is really only a prologue). Fundamentally this research was about trying to gather some base-line data about a small animal living in a big landscape. The big landscape: A river above the Arctic circle: our pseudscorpion friend can be found under the rocks alongside this river. This work presents some life-history data about a fascinating northern pseudoscorpion species, occurring only in the north-west of North America. As far as I know, it occurs only in regions that were primarily unglaciated during the last glaciation event which covered pretty much all of the northern half of the continent. However, unlike other Beringian species (e.g., the wooly mammoth), this little arachnid did not go extinct but rather continues to thrive in its somewhat unusual habitat under rocks, near rivers or streams. After collecting and measuring nearly 600 specimens, I can now tell you a bit more about the species distribution in North America, and provide some insights into its life history traits. For example, larger females tended to have higher clutch sizes, a very common and well-known pattern with other arachnids, but there was certainly a paucity of data about this for pseudoscorpions. I also know that all its life stages can be collected in the Yukon in July, and that females can carry around quite a few young (over a dozen!). But that’s about it. Beyond those fundamental life history measurements and comments on its distribution, the bulk of the species biology remains a mystery. 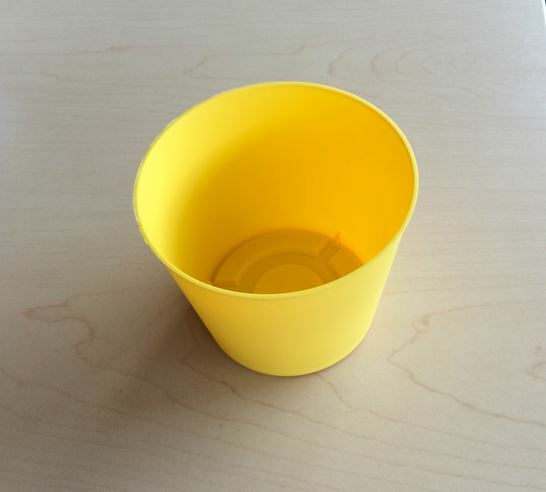 It may be possible to look at this work as a failure. Heck – a LOT of specimens were collected, by many, many enthusiastic helpers. It took some resources to get the work done (although it was mostly through stealth). A lot of time was spent at the microscope, and it certainly took a bit of time to pull together the paper. And what for? We still don’t know very much about the species: how does it disperse? How does it overwinter? How does it survive flooding of its habitat? How restrictive are the habitat affinities of the species? Do females and males tend to hang around the same rock, or do they mill about with others? What does it eat? I don’t see this as frustrating, or discouraging, because it’s a start. Before thinking about bigger questions in ecology and evolution, your first need some basics. Only then is it possible to ask broader questions about, say, phylogeography, dispersal limitation, or behaviour. I hope this work encourages others to seek out and discover new and interesting things about the unnoticed species that walk underfoot, live in tree-tops, swamps, or beneath park benches. I was very pleased to publish this work in the Canadian Field-Naturalist. Sure, it’s not a ‘high impact’ journal, but it’s a rather special and unique journal for being an excellent location to publish work on the natural history of our species. I hope others consider this journal as an outlet for their curiosity-driven science. Over time, I hope the pendulum does swing, and as a scientific community we really embrace the value of “basic” natural history data. Without a fundamental working knowledge of our species we are hamstrung when it comes to solving the big environmental challenges facing our planet. It’s time to play catch-up. Let’s worry less about impact factors and show some love for smaller journals that are brave enough to keep on publishing about natural history. Let’s spend time observing our natural world, collecting interesting data just because. I ended my paper with a paragraph about what it felt like to do this research. I am so thankful the editors allowed me to keep this paragraph. It’s important, and reflects my long-standing belief that the lines between a subjective love of nature, and objective observations about nature, should be blurred. They certainly are for me. In conclusion, observing these marvelous animals in one of the most beautiful areas of the planet, was gratifying, awe-inspiring, and helped solidify a love of natural history. What has been learned is only the prologue to a truly astounding epic: many more discoveries await. *Please check out this amazing blog post about the value of ‘observation’ to ecology. It relates closely to what I have written. I’m super-excited to announce new research from the lab, published yesterday with lead author Dr. Crystal Ernst. Crystal’s paper focused on taxonomic and functional diversity of beetles across 12 sites in northern Canada, ranging from Labrador to the Yukon Territory, and from the bottom of James Bay all the way up to the tip of Ellesmere Island. This work is result of the Northern Biodiversity Program: a multi-institutional collaborative project about the ecological structure of northern Arthropods. Crystal Ernst, on the tundra. 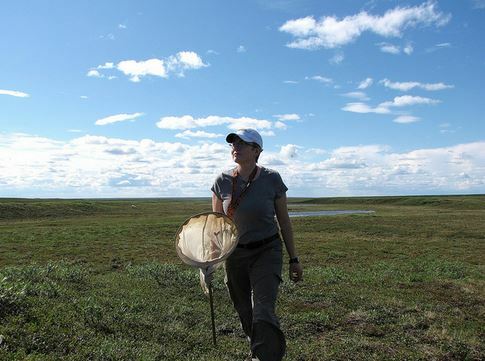 The paper was titled “Drivers and Patterns of Ground-Dwelling Beetle Biodiversity across Northern Canada” and in this research Crystal sorted and identified over 9,000 beetles from 464 species, and she classified the species by their functional ecology to assess how functional diversity may vary across the large spatial scale of this project. Instead of re-writing a summary here, I thought to use this blog post as an opportunity to reflect on what I see as the critical findings from this work, and why this is a paper that I’m incredible proud to be a part of. To me, one of the more interesting findings of this work was that the functional diversity of beetles varied by latitude: although beetles do many things (e.g., herbivore, decomposers, carnivores), it doesn’t seem like all these functions happen at all latitudes. For example, although we document an impressive number of carnivores at all the sites, they are relatively more common in the more northern locations. This is a bit peculiar, and suggests that food-webs involving arthropods vary in some important ways depending on the biome. We also document that temperature is a major explanatory variable when considering functional diversity, which raises the important question about potential effects due to climate change. Indeed, should temperatures change in the north, this may affect the functional ecology of beetles, which in turn could affect other parts of the system. The research generally supported the well-known pattern in biogeography about how species richness decreases at more northern latitudes. When looking at which environmental variable may explain this pattern, temperature again came out on top. In other words, what beetles are found where is in part due to the temperatures in that region. Climate change scenarios therefore have significant potential effects on beetles in the north: beetles, like most other arthropods, are tightly linked to temperature. Even small changes in temperatures in the north may have big consequences for beetles. One of the other big findings, to me, was the fundamental value of species-level data for an important taxa, across vast areas of Canada. Crystal recorded new Territorial and Provincial records for 15 beetle species, increasing knowledge about northern biodiversity. I’m also pleased that the data are fully available on-line, via Canadensys, so other researchers can access the information, re-analyze data, and benefit from and build upon this work. The Arctic is special: it is a vast, cold, treeless landscape, with blankets of tundra, and permafrost underfoot. But it’s also special for beetles. After Crystal analyzed the community-level beetle data, using ordination methods, it became apparent that assemblages from the Arctic Islands of Canada were distinct from the sub-Arctic and north-Boreal sites. From a conservation perspective this is quite important. To some, the Arctic may come across as a big, ‘life-less’ region, with the odd polar bear roaming about, but in reality it hosts thousands of species, including hundreds of beetle species, and that beetle community is very different from what we find in other parts of North America. Special things deserve recognition and protection. Every journalist I talked to has asked “Why beetles?” This is an easy one to answer: they fill virtually all roles in ecosystems, they are diverse, they are of interest to many people, and they are beautiful. The latter point is an important one, as it is important to capture curiosity and fascination about arthropods. 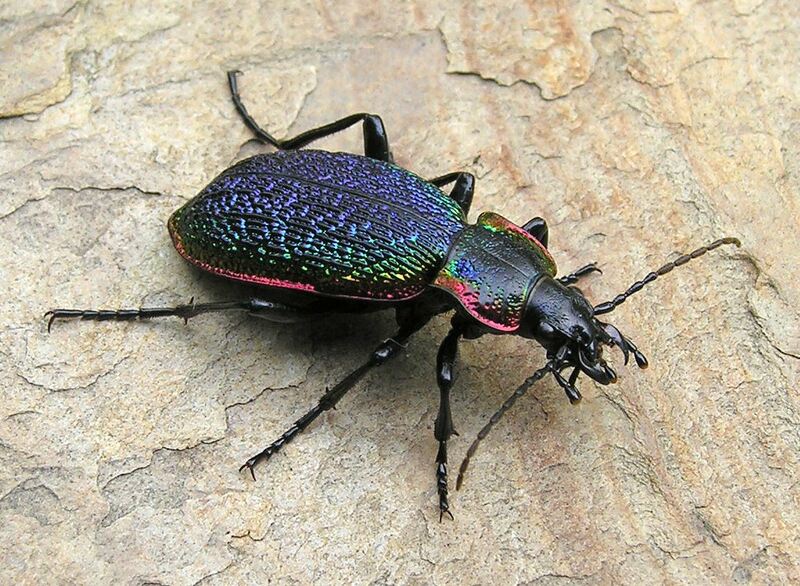 A northern beetle: Carabus vietinghoffi. Photo by Henri Goulet. In sum, this was a terrific project to be involved with, and our lab (and our collaborators) are thrilled that the efforts from the Northern Biodiversity program are showing up in the literature (for more examples, check out this, or this).